Constructed originally in 1883 on Beacon Street’s fashionable Nob Hill, between 2nd and 3rd Streets, overlooking the then-infant port, this is the oldest church in San Pedro. For twenty years, the church’s steeple was a landmark and a beacon for those on land or sea. The Carpenter’s Gothic style church features hand-hewed pews and an alter. Its lectern is upheld by an intricately-carved wooden angel. All are of redwood. By the turn of the century, San Pedro’s population began to shift to the south. In 1904, the building was moved to the Vinegar Hill section at 10th and Mesa Streets. During the move, the church lost its steeple, which was replaced with a belfry. The little church served its parishioners for another fifty years, until with capacity was deemed too small. New quarters were built for the parish, and the old wooden building stood empty and was in danger of demolition. A group of citizens of various faiths banded together to find a new site for the church, and in 1956 it was moved to its present site, deconsecrated and rededicated as a memorial chapel. 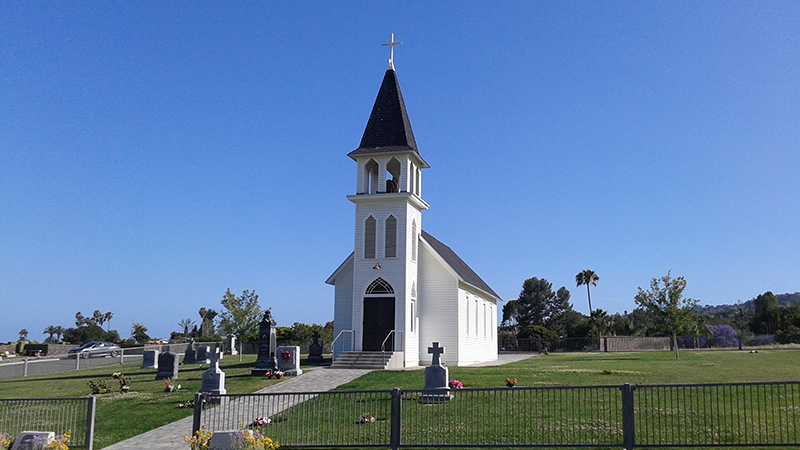 San Pedro’s first church has found its home in the town’s cemetery, amid many of its original citizens who are at their final resting place. 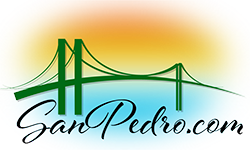 It stands today as a monument both to San Pedro’s founders and to those who have sought to preserve its history. Over the last several years the church has fallen in disrepair. In the fall of 2011 the church was dismantled, transported, and transferred to Green Hills Memorial Park. The church has been restored and is open to the public.